The McCabe-Thiele method is a graphical approach, published by McCabe and Thiele in 1925, considered to be the simplest and most instructive method for the analysis of binary distillation. This method uses the fact that the composition at each theoretical plate (or equilibrium stage) is completely determined by the mole fraction of one of the two components. heat effects such as heats of solution and heat transfer to and from the distillation column are negligible. Before starting the construction and use of a McCabe-Thiele diagram for the distillation of a binary feed, the vapor-liquid equilibrium (VLE) data must be obtained for the lower-boiling component of the feed. The first step is to draw equal sized vertical and horizontal axes of a graph. Each axis should be marked off from 0.0 to 1.0 in tenths, as shown in Figure 1. The horizontal axis will be for the mole fraction (denoted by x) of the lower-boiling feed component in the liquid phase. 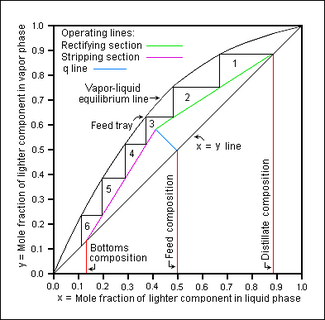 The vertical axis will be for the mole fraction (denoted by y) of the lower-boiling feed component in the vapor phase. The next step is to draw a straight 45 degree line from the point where x and y both equal 0.0 to the point where x and y both equal 1.0, which is the x = y line in Figure 1. Then draw the equilibrium line (also seen in Figure 1) using the VLE data points of the lower boiling component, representing the equilibrium vapor phase compositions for each value of liquid phase composition. Also draw the vertical red lines (from the horizontal axis up to the x = y line) for the feed and for the desired compositions of the top distillate product and the corresponding bottoms product. The next step is to draw the green operating line for the rectifying section of the distillation column (i.e., the section above the feed inlet). Starting at the intersection of the red distillate composition line and the x = y line, draw the rectifying operating line at a downward slope of L / (D + L) where L is the molar flow rate of reflux and D is the molar flow rate of the distillate product. The slope is defined as Δy/Δx. For example, in Figure 1, assuming the molar flow rate of the reflux L is 1000 moles per hour and the molar flow rate of the distillate D is 590 moles per hour, then the downward slope of the rectifying operating line is 1000 / (590 + 1000) = 0.63 which means that the y-coordinate of any point on the line decreases 0.63 units for each unit that the x-coordinate decreases. The next step is to draw the blue q-line (seen in Figure 1) from the x = y line so that it intersects the rectifying operating line. The parameter q is the mole fraction of liquid in the feed and the slope of the q-line is q / (q - 1). For example, if the feed is a saturated liquid it has no vapor, thus q = 1 and the slope of the q-line is infinite which means the line is vertical. 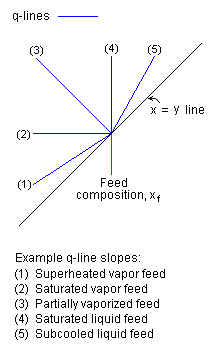 As another example, if the feed is all saturated vapor, q = 0 and the slope of the q-line is 0 which means that the line is horizontal. Some example q-line slopes are presented in Figure 2. As can be seen now, the typical McCabe-Thiele diagram in Figure 1 uses a q-line representing a partially vaporized feed. Next, as shown in Figure 1, draw the purple operating line for the stripping section of the distillation column (i.e., the section below the feed inlet). Starting at the intersection of the red bottoms composition line and the x = y line, draw the stripping section operating line up to the point where the blue q-line intersects the green operating line of the rectifying section operating line. Finally, as exemplified in Figure 1, draw the steps between operating lines and the equilibrium line and then count them. Those steps represent the theoretical plates (or equilibrium stages). The required number of theoretical plates is 6 for the binary distillation depicted in Figure 1. Note that using colored lines is not required and only used here to make the methodology easier to describe. In continuous distillation with varying reflux ratio, the mole fraction of the lighter component in the top part of the distillation column will decrease as the reflux ratio decreases. Each new reflux ratio will alter the slope of the rectifying section operating line. When the assumption of constant molar overflow is not valid, the operating lines will not be straight. Using mass and enthalpy balances in addition to vapor-liquid equilibrium data and enthalpy-concentration data, operating lines can be constructed based on Ponchon-Savarit's method. ↑ McCabe, W. L. and Smith, J. C. (1976). Unit Operations of Chemical Engineering, 3rd Edition. McGraw-Hill. ISBN 0-07-044825-6. ↑ 2.0 2.1 (1984) Perry's Chemical Engineers' Handbook, 6th Edition. McGraw-Hill. ISBN 0-07-049479-7. ↑ King, C. Judson (1971). Separation Processes. McGraw-Hill. ISBN 0-07-034610-0. This page was last modified 03:50, 18 February 2010.